Anonymous has threatened to hack the web site of the British Justice Ministry in protest against Britain's treatment of WikiLeaks founder Julian Assange. Assange has currently taken refuge inside Ecuador's embassy in London to avoid extradition to Sweden for questioning over a sexual misconduct charge. Ecuador granted the 41-year-old Australian diplomatic asylum last week, but Britain has said it will not grant him safe passage out of the UK, insisting that it must follow the law and deliver him to Sweden on a binding European arrest warrant. 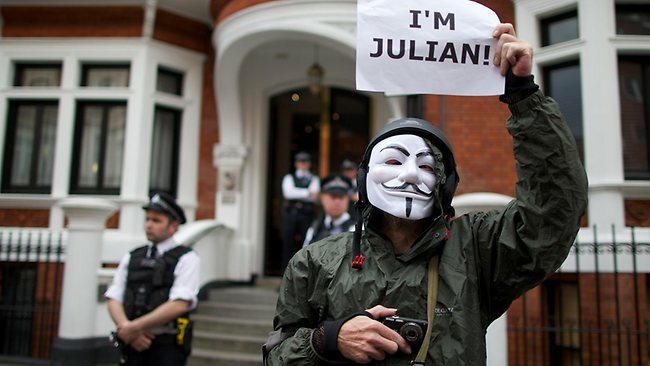 Anonymous claimed that it aimed to take down a number of British government websites as part of a campaign called "Operation Free Assange". "Gov of UK expect us!" Stuff.co.nz quoted the hacktivist group, as tweeting, on its Twitter account. The Justice Ministry said that its website was "experiencing some disruptions", but no data has been lost. "This is a public information website and no sensitive data is held on it. No other Ministry of Justice systems have been affected. Measures put in place to keep the website running mean that some visitors may be unable to access the site intermittently," it said in a statement. Assange claims that if Britain extradites him to Swedish authorities, he will be handed over to the United States as part of a Washington-orchestrated plot to make him stand trial in the US for revealing a trove of American diplomatic and military secrets, the report said. However, the United States says that such claims are "wild assertions" that try to deflect attention from the sexual misconduct allegations that Assange faces in Sweden, it added.